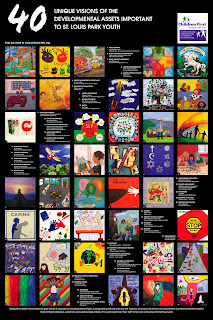 Thanks to the artists who created the fabulous 40 canvases that are now displayed on the 40 assets poster. The original art is on display through July at the Starbucks at Excelsior & Grand. Check back to see the exhibit schedule beyond July. To find out how to obtain a copy of the poster email Karen. The project was made possible through the generosity of a St. Louis Park Arts & Culture Grant, a collaborative partnership between the City of St. Louis Park, St. Louis Park Friends of the Arts and the St. Louis Park Community Foundation.